After four months it is time to go. Friday 17 th we will be back in Holanda. But first we would like to see everyone we have worked with and share some of our experiences and findings. Many people accept the inivitation so it is a very interesting mix of people and well attended evening. Very warm people we have met. Thank you, for all the time, effort and involvement!! We have a beautiful evening as our last goodbye! ....Also THANKS to Tupac for being a perfect host! 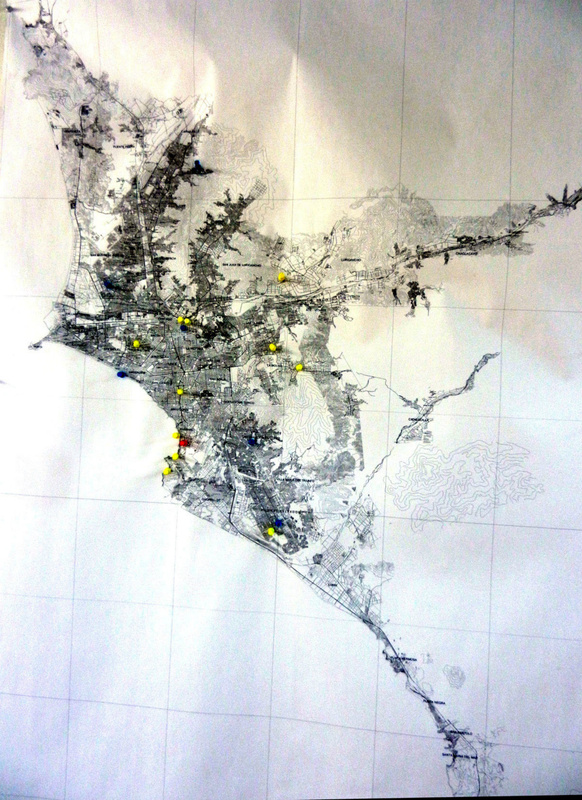 A map on our studio wall showing all the visits to the outskirts of the metropolitan area. We have seen almost all the zones with recent developments going steep into the mountains. The most incredible was a mountain in Villa Maria de Triunfo. 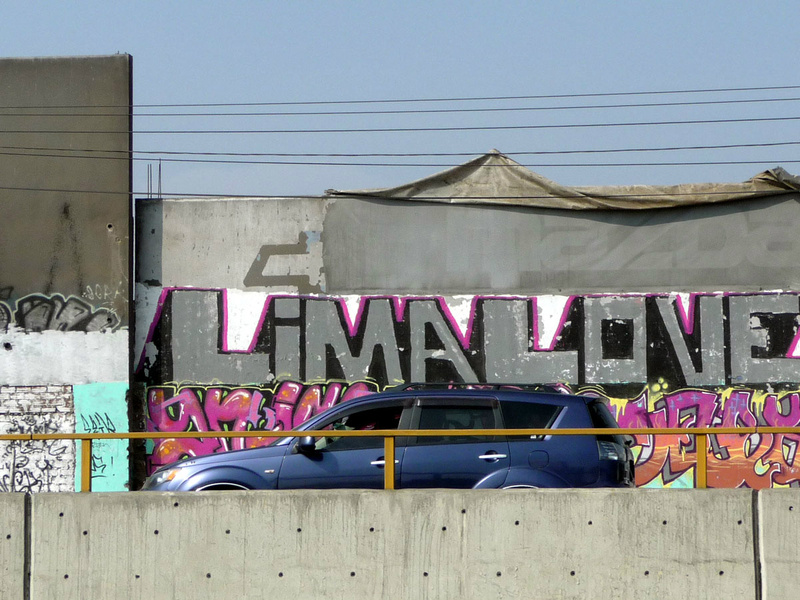 We are editing some videomaterial from this site at the east part of Lima. 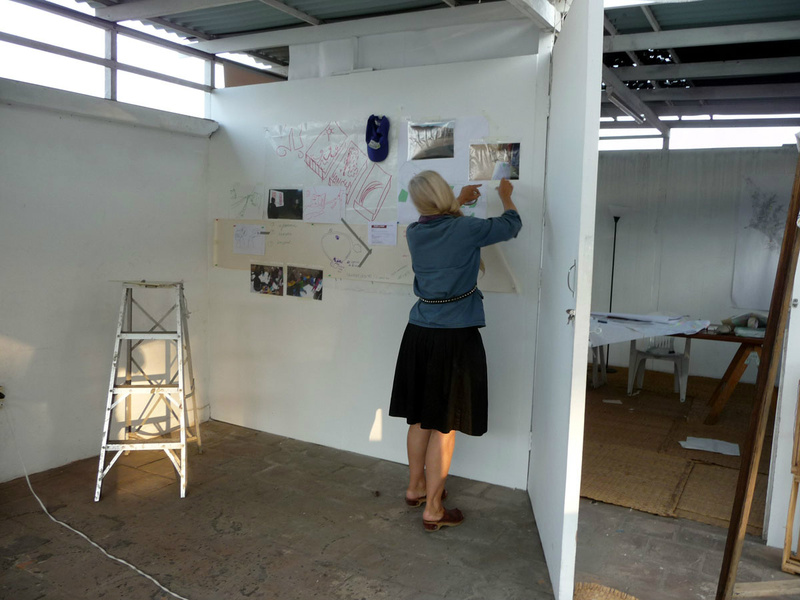 Klaar preparing for our last public evening, our open studio at Tupac on the 13 th of may at 7.30 pm. We have the opportunity for once more, to share some of our work and results with a broader audience. On our final presentation many things came together. Some of the work we did was far away in the mountanins, so it was our first opportunity to share it with a broader audience. This is a representation of our concept for Paso a Paso with Barrio Mio. To the right the project is caught in official documents so it enters the bureaucratic machinery of the municipality of Lima. Klaar introducing Pythagoras as a practise of the good example. 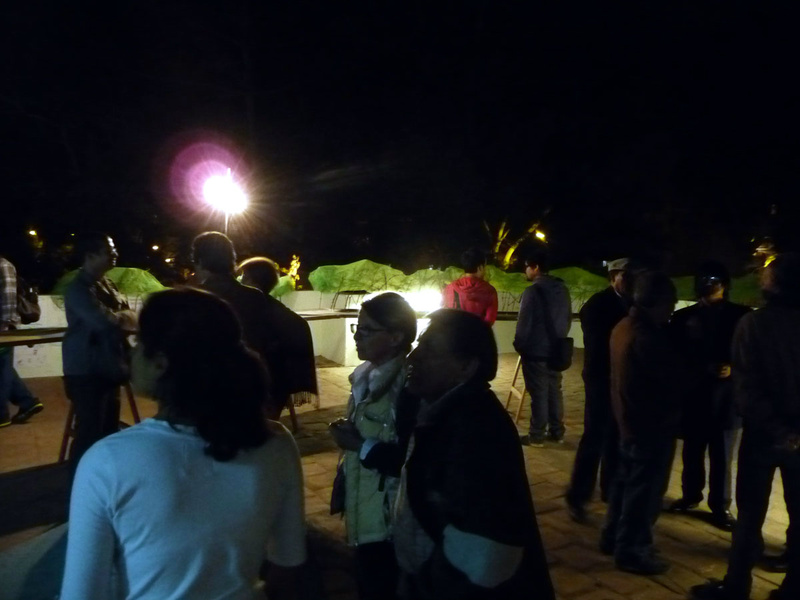 It was an intense and busy night because many people came. It made us really happy! The gerente de cultura of Lima, cultural people from the embassy, some close friends, the dean of the Catolica university, some curators many student friends and not to forget the couleur locale, some critical local artists with henry Ledgard on the topic of gentrification and citybranding. On the background one can get a glimpse of our 9 metre tall maquette of Avenida Pedro de Osma in Barranco. This is the result in daily life of collectivo Cebra. 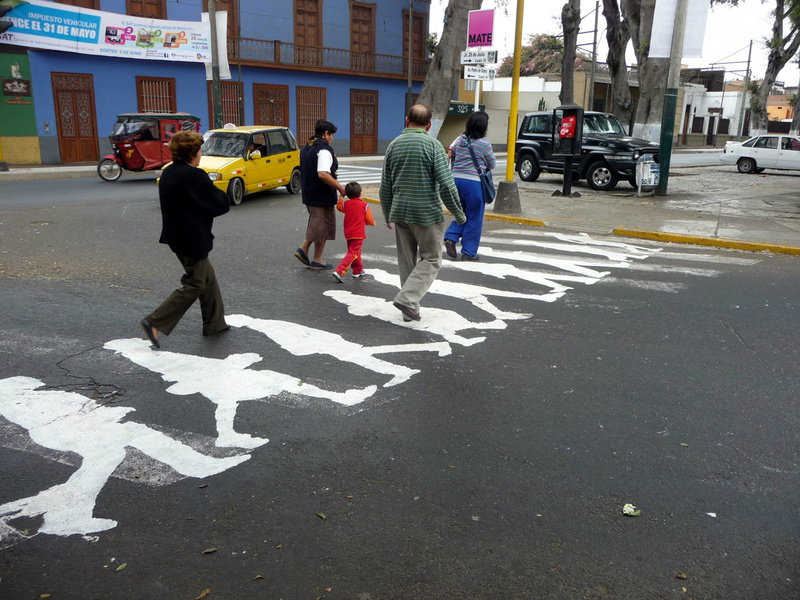 A hand painted Zebracrossing in Barranco for the people, creativity in a dangereous place. Probably the only one like this in Latin America! 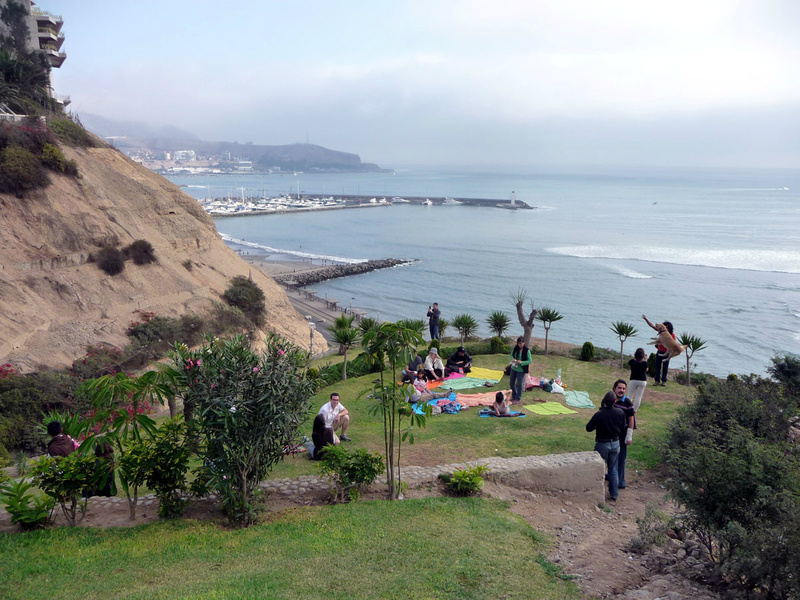 Our proposal of a low budget project to deal with public space and memory and history of the more or less anonymus Asentamienos Humanos is accepted by the Municipality of Lima. 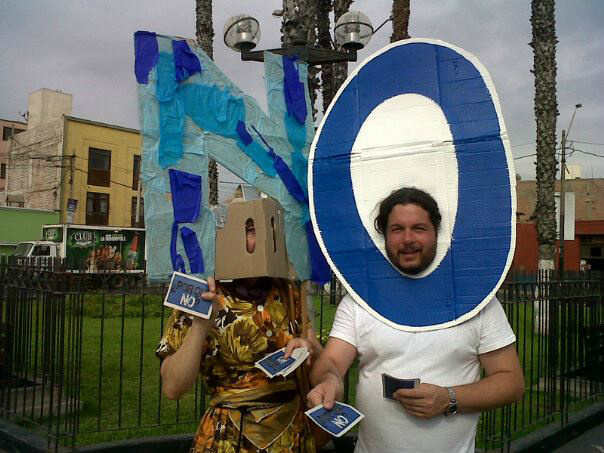 We introduced the concept to the inhabitants and explained the our motives. They wanted to make it real with us! It is now a pilot project in a place La Balanza in the mountains of Comas. 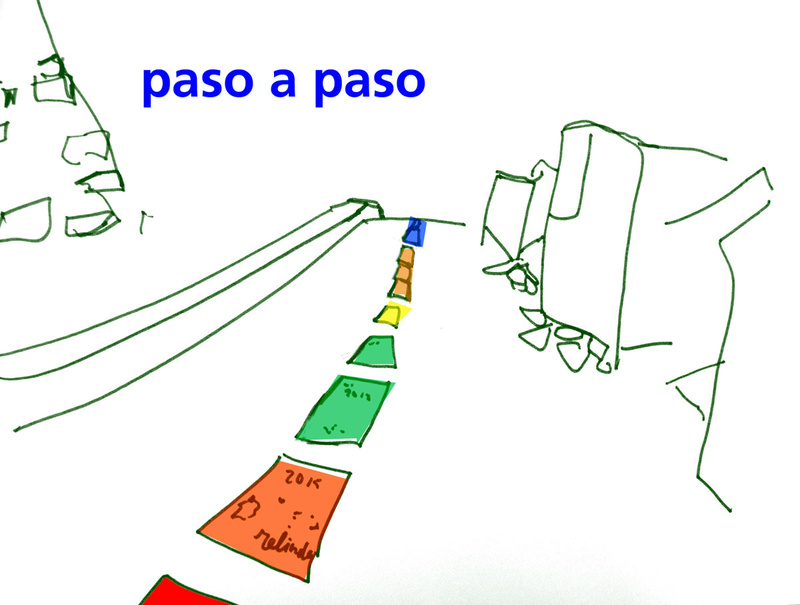 The projectname is Paso a Paso and it is about constructing a sidewalk with alternative pavement made by the people. The flagstones are devided in three parts, to make a personalized history, context and projection for each family. All together this will make a sidewalk likes pages of a book. So locals and visitors will be able to 'read' the sense of place. 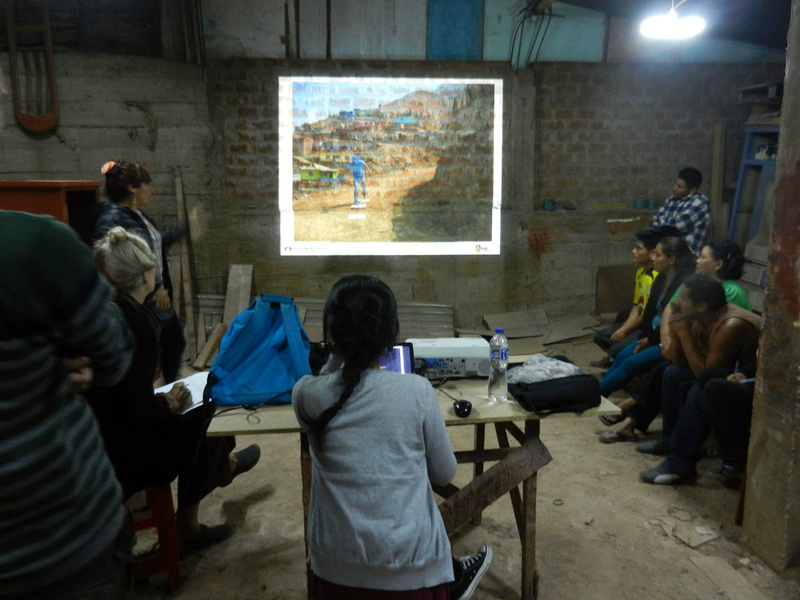 Together with the team of Barrio Mio, we present the concept to the community leaders of the specific Barrio. It is a succes. 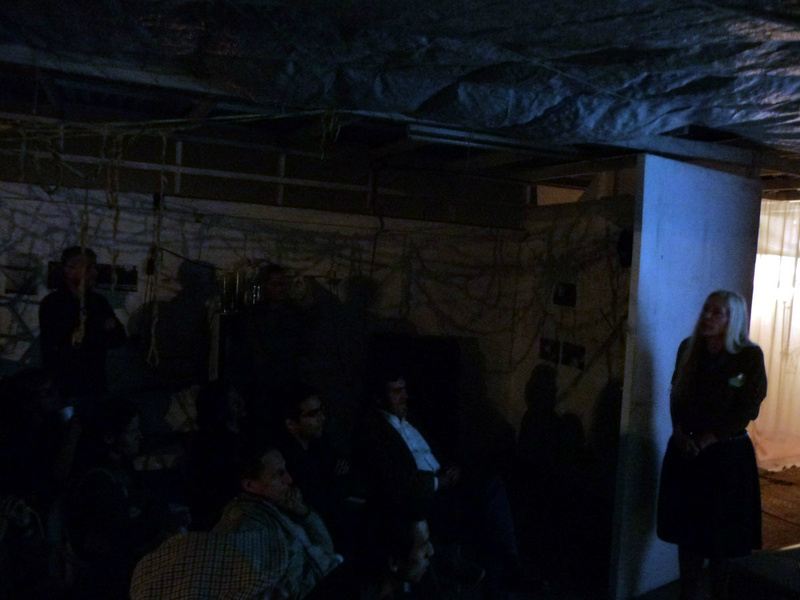 Some witnesses on our openstudio night (Taller Abierto) of our involvement in peruvian politics. Our humble contribution to the big NO campaign. No to corruption and NO to the old boys network. Eating pizzas at a friends house. 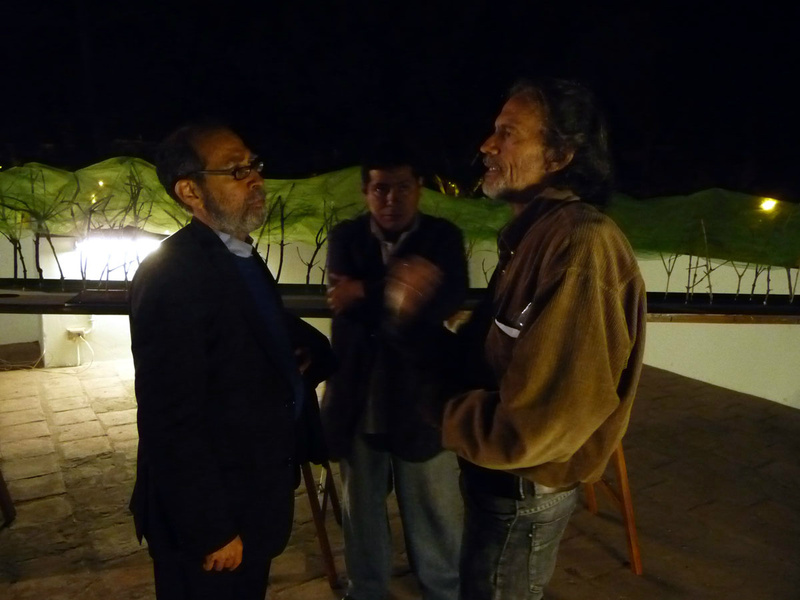 They are part of a local architect group with serious political ambitions, the Decisión Ciudadana of Barranco. Next term when ellected we will be advisers of this interesting strong group of professionals. 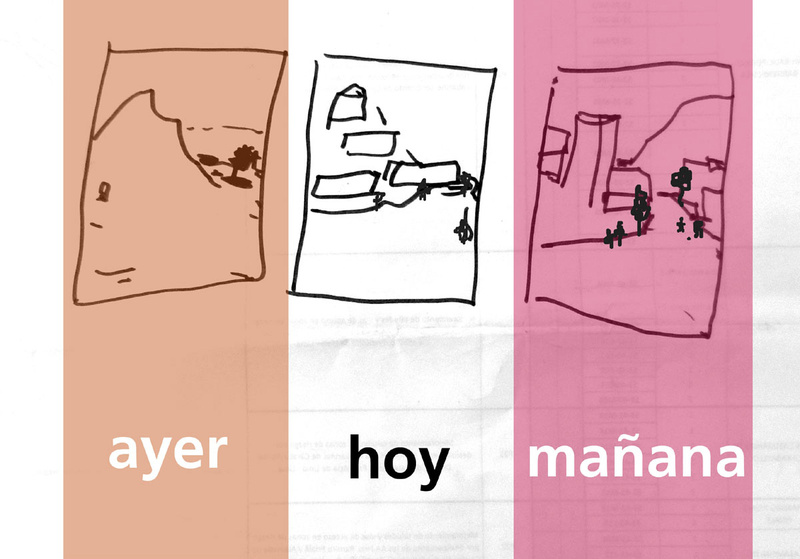 We started with workshops called: 'El pueblo es el planner', There are many people wantimng to participate. 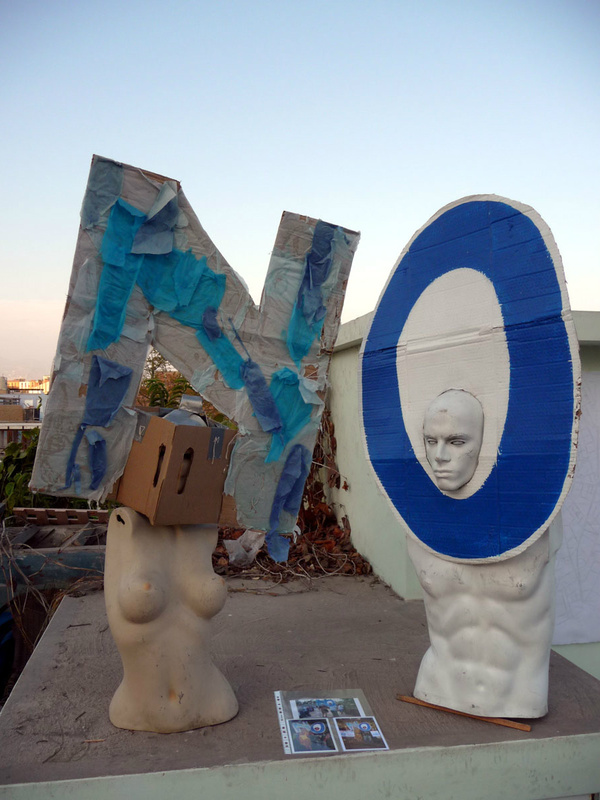 This is one of the images from the first group, we actualle make an invasion and are making different use of the public space. That's how we introduce 'learning by doing'. How to Rethink the publicspace by actions. 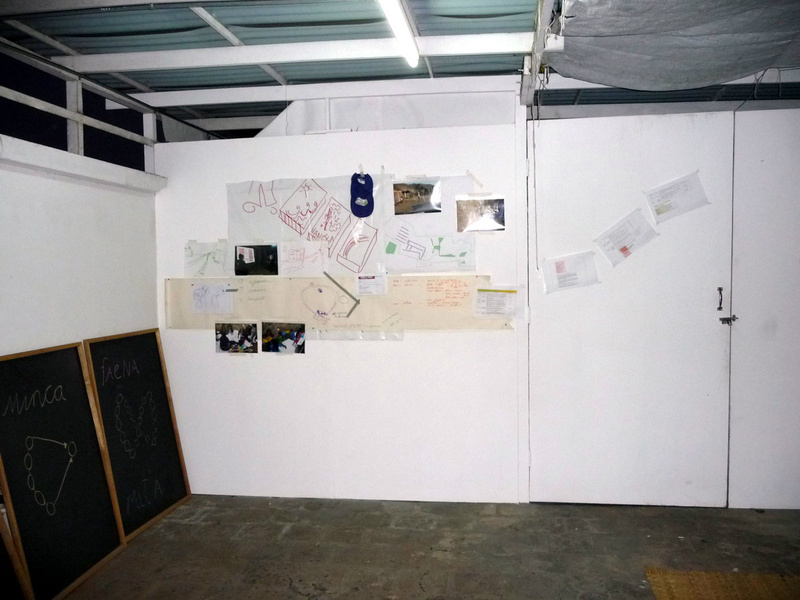 We participate in an exhibition called Experiencia, in Sala Miró Quesada Garland in Miraflores. It is an invasion in the public domain where we work with passing pedestrians. 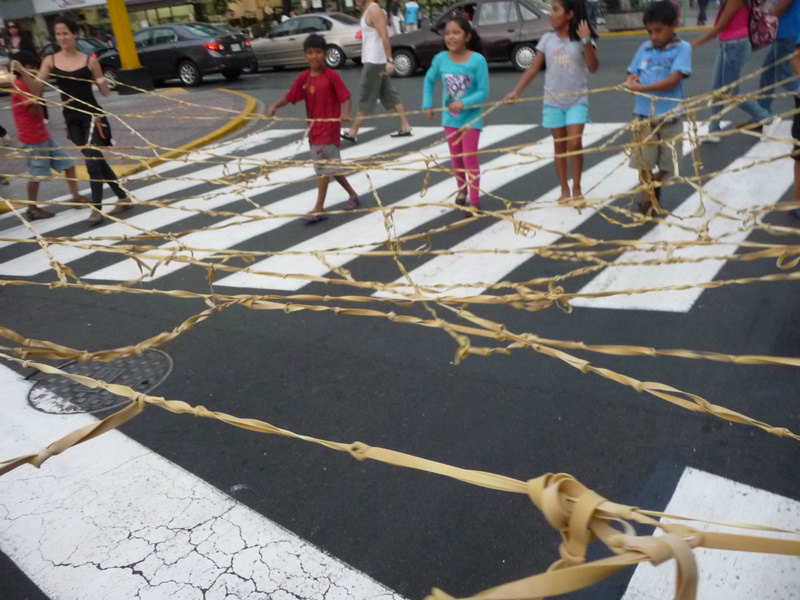 A collectivly made net in the streets to construct a socal body. It worked! 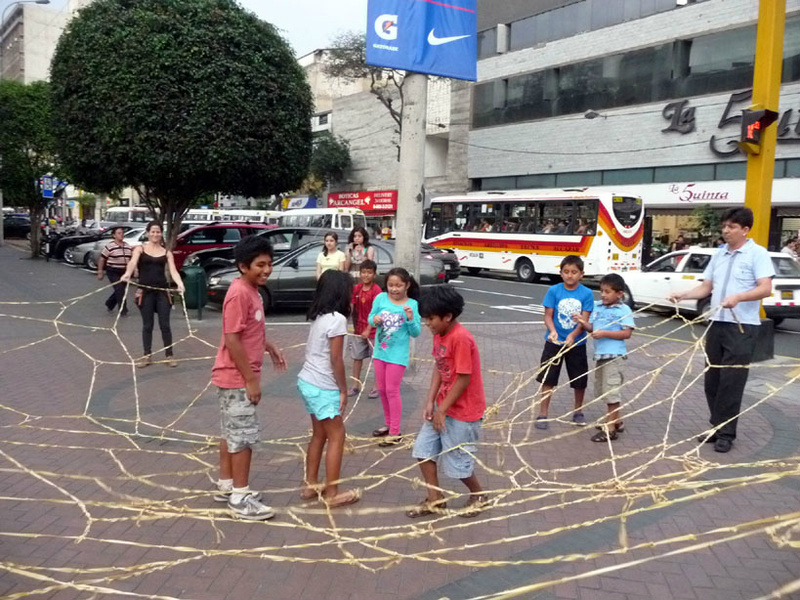 Together with bystanders we make a big net made of elastics (ligas grandes). 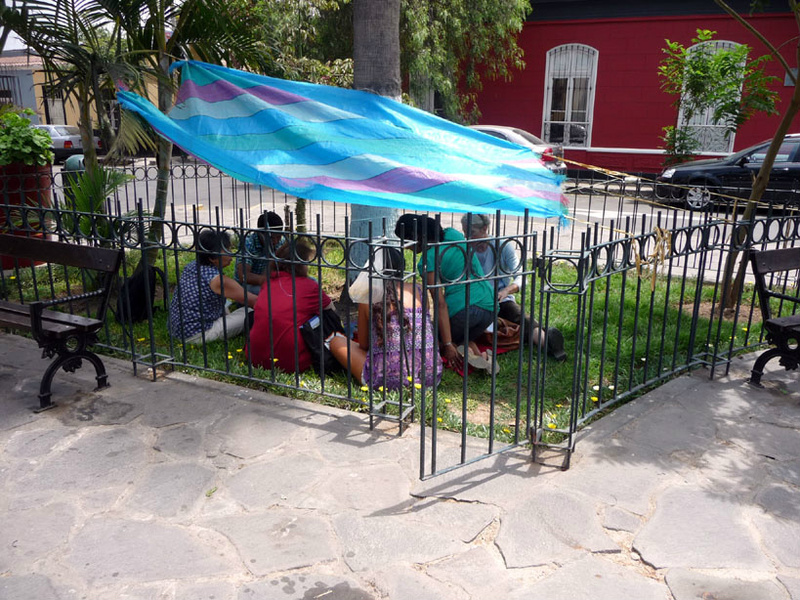 We start to move in the public space as a collective body. It is fun! On the way we meet a lot of very nice and engaged people. 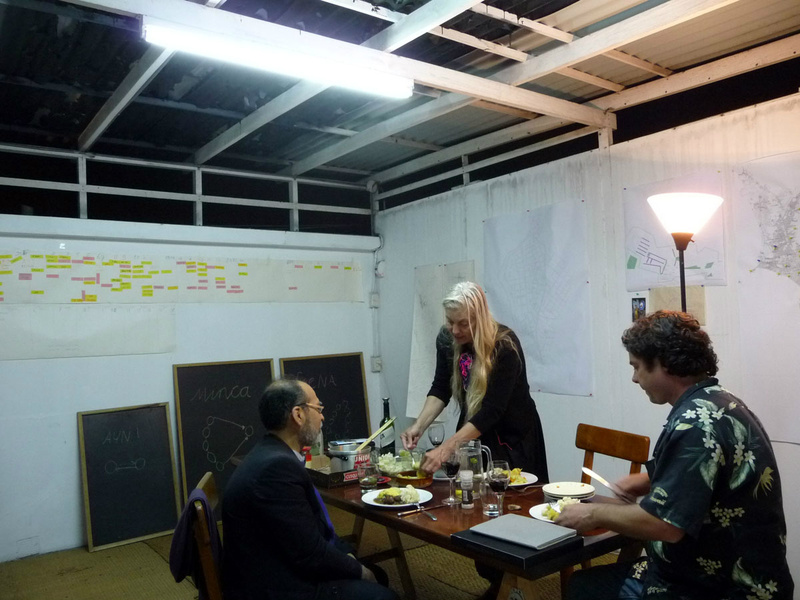 In our studio we make a dinner for the wonderfull curator and scientist Jorge Villacorta. It brings a different energy to the place.